Supply chain has evolved… so has your customer expectations. A seamless customer experience journey is no longer an option but a requirement in the age of Amazon. Your supply chain needs to innovate now, or you risk compromising your competitive edge moving forward. 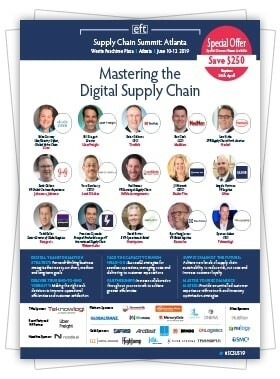 This is why the Supply Chain Summit: Atlanta (10-12 June) is your one stop shop for digital transformation of your supply chain and the only place where over 800 senior supply chain executives will be gathering to set the bar for the future of supply chain. Visionary Keynotes: This is your chance to hear from and network with industry heavyweights Peter Gibbons (CEO, TireHub), Todd Soller (Senior Director of Global Logistics, Patagonia), Yone Dewberry (CSCO, Land O’Lakes), Edna Conway (Chief Security Officer, Value Chain, Cisco) and more.